Thick hair is desirable. Who wouldn’t want luscious flowing locks like the celebrities on the red carpet. But do you really think that every celeb who looks so perfect has thick hair? Fat chance! The more likely possibility is that they have access to talented hair stylists who know exactly what to do to make hair appear thicker. Here are a few pointers that you can try if you’ve been looking for a solution to your thin hair woes. Getting bangs is a simple, low-maintenance, low risk way to make your hair appear a little fuller than usual. Heavier bangs of the blunt variety do the job extremely well. Look at Taylor Swift and Jessica Beil. They often wear brow-grazing bangs and you can see for yourself how well that works for them. But before you go chopping your locks off, make sure that bangs suit your face. Or opt for the type of bangs which look good on you. It’s a good idea to see a really good hairstylist for advice on this one. Layers have long been known to add volume and make hair appear thicker. You can go one step further to really make a difference. Cut layers under the layers. For example, if your hair has been cut into a layer at about ear-length, then cut the hair under those top layers about half an inch more. This adds volume but also pushes the top layer out a bit, sort of like padding. Styling your hair in big curls can make it look like your hair is thicker than it really is. Whether you use a curling iron or a bunch of rollers to set the look does not matter. Curls rule when it comes to adding volume, plus they’re super-stylish and feminine! Here, we don’t mean two-toned in the way that’s very obvious. Rather, the idea is to go for a more subtle approach and let the eyes deceive the observer. Dye the layer of hair underneath the top-most layer a shade or two darker than your natural hair color. 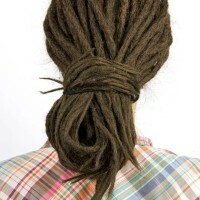 This will give the illusion of depth and fullness, making it seem like your locks are thicker than they actually are. Highlighting works on the same principle as the previous tip. The two to three different shades make it seem like there is more hair. However, in truth the peroxide that is a normal part of the hair dyeing process also contributes by actually making your hair swell a bit, which makes it appear thicker. 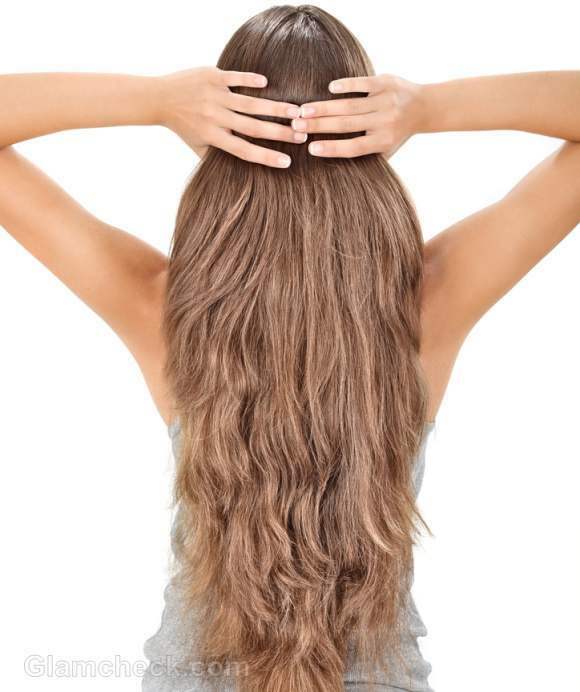 If you have thin hair, you may have noticed that the longer it gets, the more apparent its thinness. That’s mainly because thin hair, which is usually brittle in nature, tends to start breaking as it gets longer. The trick then is to not let it get to the stage where it becomes vulnerable to breakage. Hair stylists suggest opting for haircuts above shoulder-length. There are several bobs and cropped looks which can be modified to look good for most face types. So don’t fear that you’ll be sacrificing on beauty by following this tip. This is something you can do without preparation or a trip to the salon. Simply keep a few hair extensions handy, the clip-on types, and clip them into your hair when you desire a thicker look. A simple way to blow dry for more thickness is to flip your hair upside down first. Blow dry till it’s almost dry but not quite there yet. Then flip your hair back up. Now, use a round brush to lift the hair gently and blow dry. This will add more volume, making your hair appear thicker. Another tip is to avoid creating a parting while you blow dry and on the side that you are planning on wearing it. For example, let’s say you plan to wear your hair from a left parting for the day. 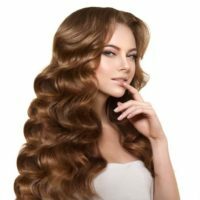 If you make the parting on the left in the midst of blow drying, you will notice that the hair around the parting gets sort of flat, thus defeating your efforts at gaining more volume. To combat this common problem, part your hair on the right instead while you blow dry. Make a parting on the left after you are done blow drying. Use your fingers as even the slight pressure from a hair brush can flatten your hair back down. This tip should only be used as a last resort or in an emergency. 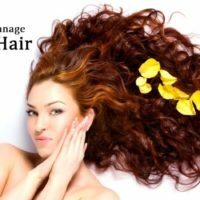 There are several hair products on the market from sprays to mousses which can make your hair more voluminous which gives the appearance of thickness. A super trick is to dab some volumising mousse into damp tresses at night and then tie them in a braid. The next morning, you’ll have volume plus the illusion of thickness from the curls that will form naturally once the braid is undone! While products often work quite well, it isn’t advisable to rely on them for results on a regular basis as many of them contain chemicals which work against the health of your hair in the long run. If you have thin hair, you have to spend a lifetime dealing with it. There’s not much you can do to change the structure of your hair. Well, not yet anyway. Technology may have answers in the future. Until that happens, do your best to take care of your hair so that it at least remains strong and healthy, thus less prone to breakage and even more thinning. Oil your hair about once a week and wash off after an hour or so. Traditional wisdom suggests coconut oil, but you can try several different types of oils to see what works best for you. Even olive oil from your pantry can do wonders in moisturising your scalp as well as strengthening the shaft of your hair. Volumising shampoos, if used regularly, can make a difference in how your hair looks. Buy one for your hair type and use about twice a week. If you don’t see a change in 3 to 4 months, then maybe that particular shampoo isn’t working for you. Change to another one. One of the worst things you can do is keep using a beauty product out of nothing more than habit. Remember to wash out conditioner properly from your hair so that there are no residues on your scalp. By using product, there is always buildup in your hair anyway, so be extra vigilant about reducing the impact as much as possible. More residue on the scalp can lead to dandruff, excessive dryness or oiliness depending on hair/skin type, blocking of pores on the scalp and a host of other problems which can lead to even more thinning.